Thank you for an excellent tour package of Japan. 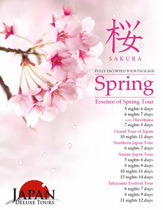 Thank you to Japan Deluxe Tours for an excellent tour package of Japan. Overall we had a great time. We're very pleased with all the places, the food, and the services that the company provided, We'll definitely come back to Japan again to explore more. Midori-san is the best and caring tour guide that we ever had. Not only she's knowledgeable but she's very informative of all the locations that she showed us. We're very lucky to have her as our tour guide.